Getting a new roof installed in Brighton Michigan? Be sure to check out this article which outlines and explains some things you’ll want to consider before moving forward with a project. Here at Livingston Roof Pros we can install a new roof in Brighton Michigan or if you only need roof repair we can also provide that service. Before doing any type of roofing project however, getting a roofing estimate is needed. Understanding that estimate can be frustrating and confusing so we’ll also go over some choices that you’ll be faced with as well. A new roof on your home can protect you and your family for many years to come. Most roofing materials last from 15 years to over 50 years for higher grade roofing materials and choosing which one goes on your home is a must. After you get a roofing estimate on your home you’ll see a list of itemized materials that will be used on the roofing project in Brighton Michigan. The type and brand of the roofing materials will be listed. Since roofing materials will fluctuate from time to time the roofing estimate may only last for 30 days or so. It will likely have an expiration date listed on the estimate. Typically, if the home owner wants the same roofing materials installed on the home it will list that quality of materials. There are many different materials that are used on a roofing project if the roofing is going to be replaced. Having higher quality materials though out the project will help your roof last longer and protect your home better. But, just like with anything else, you get what you pay for. Higher quality materials installed on the roof will last longer and have better warranties but it will likely come with a higher price. Finding a happy medium for cost and quality in the roofing material can ensure your home is protected and you get the best possible pricing on your home’s roof. If you’re looking for an economical way to get a new roof be sure to talk with one of our team members on installing a roof on your home without all the frills and using lower quality shingles. 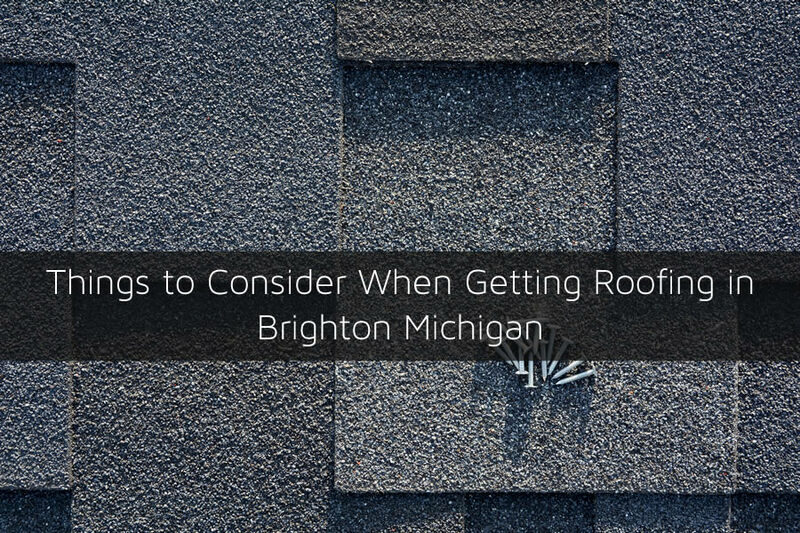 One of the biggest cost differences when it comes to installing a new roof in Brighton Michigan is how the roof will be installed. There are two different methods for installing a roof which can vary in their prices. Although both methods will leave your home with a new roof in Brighton Michigan they are very different. The first method is called re-roofing the home. When a home is re-roofed a new layer of asphalt shingles are basically placed on top of the existing roof. The older shingles are not removed from the home. The biggest issue with this method is that it adds lots of weight to the home. Plus, it doesn’t allow the roofing team to inspect the roof decking which may have problems. It’s very economical because less materials are used plus there is much less debris removal and cleanup costs involved. The other method to install a new roof in Brighton Michigan is to completely remove all the old shingles and under-layment. This is a labor intensive process that will cost more. There is also more debris removal costs as well as cleanup costs. However, it allows us to completely inspect the roof decking and ensure that any problems are repaired prior to installing the new roofing materials. When you have a roofing contractor in Brighton Michigan come out to install a new roof make sure you use a contract for the project. A contract not only protects the roofing contractor but it also protects you the home owner. It should have the materials used, roofing method used, and more. Look over the contract and get a copy for yourself in case there are problems with the roof later.